A geographic information system (GIS) can capture, store, analyze, and manage data linked to geographic locations. Creating maps is the most basic GIS function, and drawing inferences from these visualizations is a much more powerful application of GIS. As a decision-making tool, GIS can be used to visualize and better understand relationships, patterns, and trends of illness and health care resources. Many GIS applications are available publicly, but creating meaningful visualizations and accurate interpretations can be a difficult task. NCIPH partnered with Carolinas HealthCare System (now Atrium Health) to develop an online interactive map to assess 12 Social Determinants of Health (SDOH) indicators at the neighborhood-level within their 10-county service region. 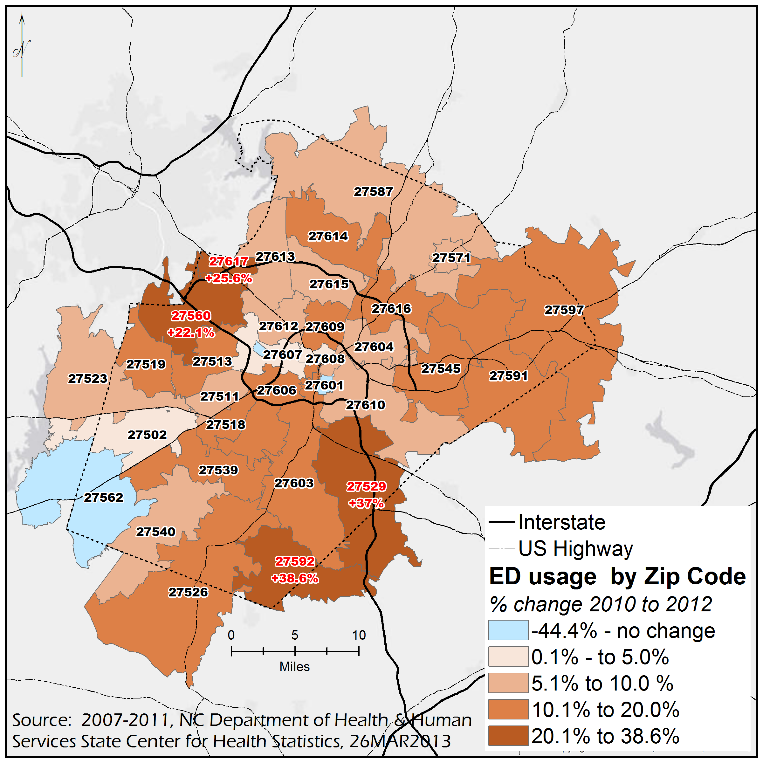 Using the 12 indicators, NCIPH created a SDOH index that identifies the neighborhoods with the highest disparities. This interactive map created by NCIPH is a guided approach to synthesizing SDOH data that can be used to more effectively focus interventions and outreach in areas of need. Since 2009, NCIPH has provided GIS training and technical assistance for 31 projects in North Carolina, Georgia, West Virginia and Kentucky. Does your organization need help leveraging GIS? NCIPH can provide training and support for agencies seeking help with GIS as a data collection and decision-making tool.